Brighten up your night with these night flowering, often fragrant plants that attract the hummingbird-like moths and other night time pollinators. Huge 4-5" double blooms are intensely fragrant! 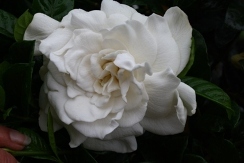 Aimee Yoshioka is the largest flowered of all Gardenias with large, glossy, dark green foliage on a vigorous and moderately fast growing evergreen shrub. The large dark foliage provides a wonderful foil for the large white flowers. Easily trained into a tree standard. 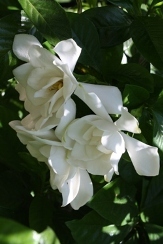 Aimee is also considered to be one of the largest growing Gardenias, particularly in mild winter climates where it is known to reach 10-12' high but 5-6' may be more typical. Item# 1154. 2-3" double white, wonderfully fragrant flowers are borne over an exceptionally long period on this hardy evergreen shrub. Rich deep green foliage on a dense upright to rounded plant. One of the favorites among the larger growing Gardenia varieties in southern regions due to its long flowering season and hardiness. Item# 310. 8-10" long double or triple yellow, night fragrant, cornucopia like trumpets are borne throughout the warmer months of the year or nearly year round when grown in a greenhouse or conservatory. Also known as Devil's Trumpet, due to the poisonous properties of this member of the Nightshade family. 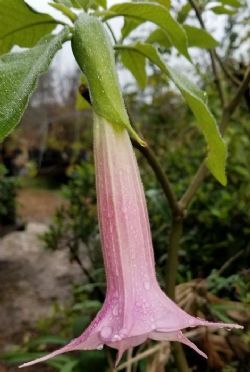 The Double Yellow Angel's Trumpet is often grown as an annual or short-lived shrub-like perennial and it is easy enough to save a few seed from the large capsules once they split open to grow new ones for next year. These are fast growing, small to medium-sized, shrub-like, frost tender tropical plants that are easy and rewarding. Item # 10366. Long white fragrant trumpets are held on tall sturdy stems in mid to late summer. 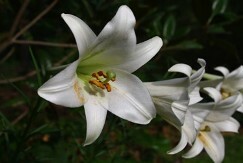 One of the tallest lilies that may reach 7' or more. Extremely easy to grow and readily naturalizes. A favorite pass-along heirloom that will adorn your garden for years to come. The Formosa or Phillipine Lily attracts a variety of pollinators including Hummingbird Moths and so makes an excellent addition to the Moon/Moth garden with it's large showy white flowers. Item# 9521. Fragrant Pathways Gardenia is an exceptionally low growing and spreading form of the Dwarf Gardenia that produces fragrant, double white blossoms in late spring and early summer. The narrow, dark green, finer textured foliage of Fragrant Pathways adds to its interest as it creates a low evergreen groundcover. Considered to be slightly more cold hardy than G. radicans. Item# 10152. 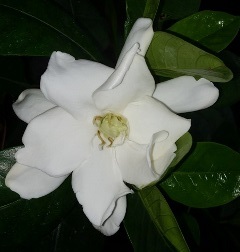 A wonderfully free-flowering Gardenia that was selected by Greg Grant from seed collected from Rosedown Plantation and named in honor of the garden's owner and horticulturist Martha Turnbull. 2-3" sweetly fragrant, white star-like single flowers are born over a long period beginning in spring and lasting through summer. 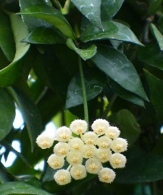 Cross-pollinated flowers will produce bright orange hips to provide winter interest. Item# 9867. Grows To: Slowly to 6'H x 6'W, up to 15'H. An extremely rare form of the Tahitian Gardenia with double flowers. 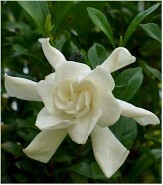 The Tahitian Gardenia boasts some of the largest flowers in the genus Gardenia with flowers up to 5" wide. Large rounded dark green tropical foliage adorns the stems of this evergreen tropical shrub. Plant out of doors only in the mildest climates while it still makes an easy container plant in cooler regions. Item# 9977. Jean Pasko Angel's Trumpet, sometimes Jean Pasco, produces 10" long, fragrant, dangling trumpets that are a combination of dark orange, gold, and yellow. 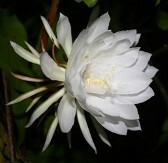 A natural hybrid discovered by its namesake in Columbia and is a widely popular and free-flowering selection. Angel's Trumpets are fast growing tropical shrubs that act-like dieback perennials in the northern parts of its range but readily return from the roots in spring. They make easy container plants as well. Item# 10747. Huge clusters of 1-1/2" tubular orange-yellow flowers are borne profusely throughout summer and fall on this vigorous shrub-like perennial and attract hummingbirds, bees, and other pollinators. The flowers are sweetly fragrant at night and likely attract hummingbird moths. Yellow Cestrum becomes large and shrub like in mild winter climates whereas in the coldest portions of its range, like zone 8B, it will often freeze to the ground and return in spring. A loose breathable mulch will also help to ensure that your Yellow (aka ' Gold') Cestrum returns each spring. Item# 749.